Opioid addiction is a rising epidemic amongst the United States that shows no signs of stopping anytime soon. Opioid addiction can happen to anyone and affect any family; it knows no bounds of race, gender, age, ethnicity, wealth, or status. Presently, the opioid crisis takes the lives of more than 130 Americans daily. The National Personal Training Institute believes in giving back to the communities in which we serve. That being said, we are offering $2 million dollars a year in full scholarships to our online Personal Training Certification for those affected by the opioid epidemic. We hope to provide a new outlook on life for those who have been affected by opioid addiction, giving them a chance to start a new and exciting career involving health and wellness. Research has shown that with proper precautions exercise can be a safe and beneficial addition to any treatment and recovery plan. Furthermore, fitness has been proven to prevent, or help lessen the effects of, a number of health problems such as heart disease, diabetes, arthritis, certain cancers, and chronic back pain. One of the hallmarks of the benefits of exercise is the ability that exercise has to reduce stress. The benefits of exercise are greatly felt in an individual suffering from previous addiction. Here at the National Personal Training Institute we hope to help reduce the number of individuals suffering from addiction by replacing their current addiction with a healthier habit, such as exercise. 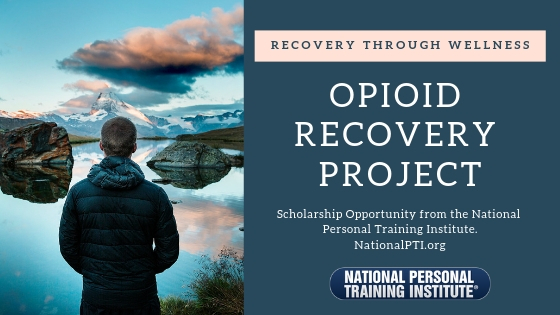 For more information go to https://nationalpti.org/opioid-recovery-project/. There, you can find more information about the program itself and instructions on how to apply for this scholarship opportunity.